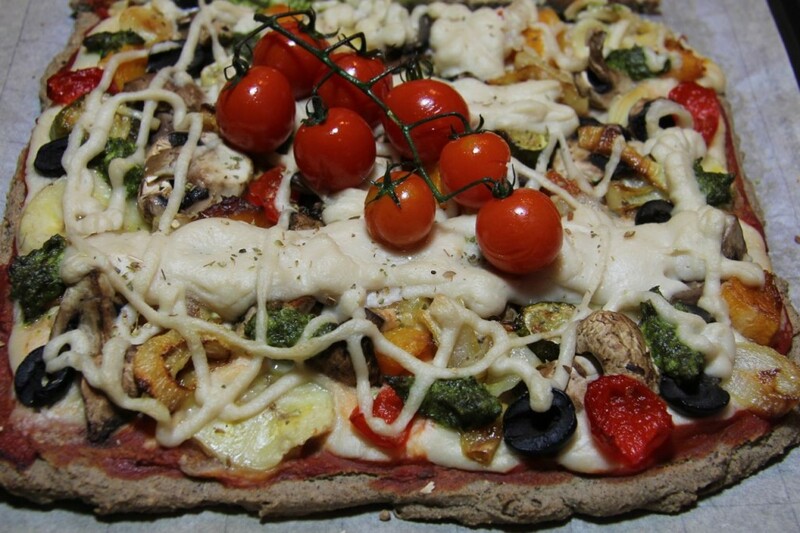 I have long been searching for the perfect vegan pizza – one that fills all the gaps that traditional, cheesy, glutenous pizzas used to. I came across Ella’s quinoa pizza and tried several others, but although these were all amazingly delicious, they just were not quite the same as traditional pizzas. Preheat oven to 200° C. Mix all dry pizza base ingredients together and then add the water, mixing well. Set aside for 10 minutes, then pour dough into a lined pizza pan or baking tray. Smooth it out with a spatula. The dough will not be runny, but it isn’t as thick as normal pizza dough either. It is more like a really thick batter. Place this into the oven and bake for 10-15 minutes or until the dough/batter is no longer wet/doughy on top – it should look cooked. While the base is in the oven, make the cashew cheese. Simply blend all of the cheese ingredients together in your blender until smooth. You can soak your nuts first, but to be honest, I never do and it turns out perfectly every time. Just be sure to blend your mixture long enough for it to be very smooth. Taste it and add more salt to taste (I like it best as is). Pour this mixture into a small pot (don’t stress if there is a small cashew piece here and there at the bottom of the mixture – you won’t notice it at the end.) Cook over medium heat on your stove, whisking intermittently, until it starts to thicken. Whisk vigorously and remove from heat. At this point it is like a thick cheese sauce – delicious! Spread passata/tomato sauce/paste onto your base and then spread a layer of cheese on top of that. Add your topping. Now pour the rest of the cheese on top of that – I like to use a piping bag so that it looks pretty:) Sprinkle with origanum and pop into the oven. Bake until done to your liking. Watch that the cheese doesn’t burn. 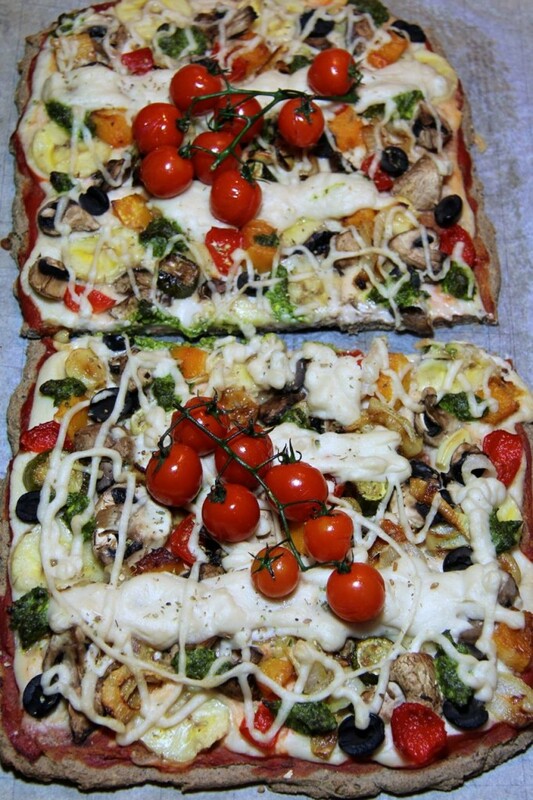 This pizza is lovely … my only suggestion is to go light on the cheese. It can become rich and somewhat overpowering. lol:) I got the exact opposite request from my husband who asked me, “Can you maybe make more of that cheese sauce next time – it’s so good!” Yes, the cheese sauce IS certainly very rich – just like regular dairy cheese can be very rich when you use a lot of it. If you are sensitive to very rich food, it may be a good idea to half the cheese sauce recipe and perhaps, rather than spreading the cheese on the base AND drizzling it over the top, maybe just drizzle it over the top and use plain passata on the base. That way you will be getting all the flavour without the richness. Glad you like the recipe! I absolutely loved the pizza! What a nice base. To me the pizza is perfect without the cheeze. I never enjoyed pizzas before and thought it was the floppy bases. Now I know it was the cheeze! Therefore my order will be without cheeze and that is perfection. Give my cheeze to Malcolm, then we will both be happy!